Almost from the moment 10 year old twins Eva and Miriam Mozes stepped out of the cattle car that brought them to Auschwitz, they were separated from their mother, father, and older sisters, never to see them again. Eva comments over and over on the constant smell that permeated Auschwitz from the gas chambers, but even as she instinctively knows that this is the fateful death that the rest of her family had immediately met, she continues to hope they could somehow survive. The girls were put into a barracks with all the other twins chosen for the sadistic, inhuman medical experiments of Dr. Josef Mengele, the Angel of Death. Eva, the stronger of the twins, takes it upon herself to look after and care for her sister Miriam. Like all of Mengele’s twins, Eva and Miriam were allowed to keep the clothing they arrived in, as well as their hair, but they were forced to scrounge and “organize” for anything else that would help them survive, even as they were being experimented on. The strength and resourcefulness of these two girls amazed me. Once day, for example, Eva was given a shot that Miriam was not also given. During the night, she began to run a high fever, within 48 hours her legs were swollen and covered with red patches. Despite the pain and chills these caused, Eva was determined to stand for roll call and not go to the infirmary, since the only way out of it was death and they knew that if one twin died, the other would be killed. She missed roll call thanks to an air raid, but was soon sent to the infirmary to die anyway. On a visit with other doctors, Mengele indicated she had only two weeks to live. But Eva was determined not to be sent to the gas chamber, even though she was not fed or given water. Desperately thirsty, each night, she would crawl on all fours to the end of the infirmary barracks to a water faucet, determined to live. After two weeks, Eva’s high fever broke. But she had to learn how to manipulate the thermometer to fool Mengele into thinking her temperature was normal. Unfortunately, when Eva returned to the barracks and Miriam, she discovered that, because the doctors believed that she would die, her sister had been subjected to injections that caused to her to quite listless and which ultimately stunted the growth of her kidneys. Both of these 10 year old sisters managed to stay alive in Auschwitz, despite Mengele’s horrendous genetic experiments. Their story is a testament to courage and determination, which will, hopefully, be especially interesting to young readers. And, although I am a firm believer in forgiveness, even I am amazed that Eva was able to eventually find it within herself to forgive Mengele. I’m not sure I could or would go that far. Mengele, after all, was the arbiter of life and death at Auschwitz. 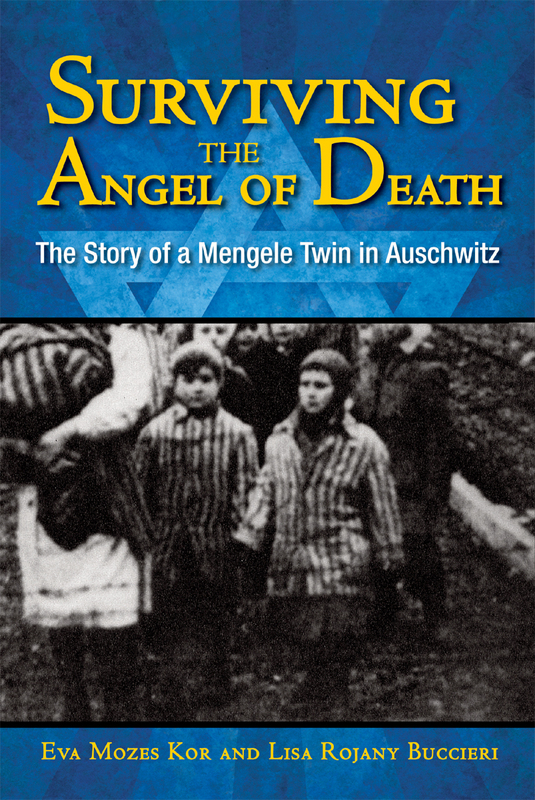 Surviving the Angel of Death: the Story of a Mengele Twin in Auschwitz is told in a straightforward manner, neither too graphic to scare readers nor so sketchy that it diminishes the level of cruel, heartless treatment Mengele’s twins were subjected to. The writing style is intimate and informal, as though Eva Mozes were telling her story to Lisa Rojany Bucceri and I was allowed to listen in. It never gets pedantic, and there is never a sense of self-pity. I suspect Eva is still the same strong feisty fighter now that she was at 10. The book also contains a number of personal family photos of the Mozes family, some from before the war, some from after, as well as pictures their life after the war. There are also general photographs of Auschwitz. After the war, Eva lived in Israel for a while, and then moved to Terre Haute, Indiana with her husband, Michael Kor, another concentration camp survivor and with whom she had two children. She still lives in Terre Haute, where she founded the Candles Holocaust Museum in 1995. This book is highly recommended for readers age 12 and up. The book was a received as an E-ARC from Netgalley.com. An excellent and extensive Teacher’s Guide to Surviving the Angel of Death: the Story of a Mengele Twin in Auschwitz, created by Natalie Dias Lorenzi, is also available. Ara Pacis Initiative presents an interesting profile of Eva that appeared in Vanity Fair Italia in 2010. NB The photo on the cover of this book was taken by the Russians when they liberated Auschwitz. The photo shows Eva on the left and Miriam on the right. It was, however, a staged photo-op, in which the twins were told to wear the striped clothing of Auschwitz prisoners, something Mengele's twins did not have to do. Wow, this is a mighty heavy content - and I am so glad that you have shared this with us today. I was in Berlin last May and had a chance to visit Mauthausen while I was in Austria. I didn't have a chance to visit Auschwitz though, but I really wanted to especially after reading Art Spiegelman's Maus I and II. Your review has reminded me of how I felt as I was touching the walls in Vienna and in Berlin. No words, really. Thank you for sharing this. I ordered a copy of this and have had students already asking about it, since a science teacher was mentioning Mengele. Heavy, but relevant to the 8th grade curriculum! Thanks for stopping by and commenting. This book really is quite memorable for the courage of Eva and Miriam. What was done to people in concentration camps really is unspeakable, but Eva and Miriam are examples of how strong the human spirit can be under these circumstances. This looks so painful to read. I visited Auschwitz in 2003. I am sure this books will feel even more vivid to me now than it would have before the visit.